WARM TIPS: Please do note this two way radio headset does not work with Motorola walkie talkise, please check your models before placing orders. 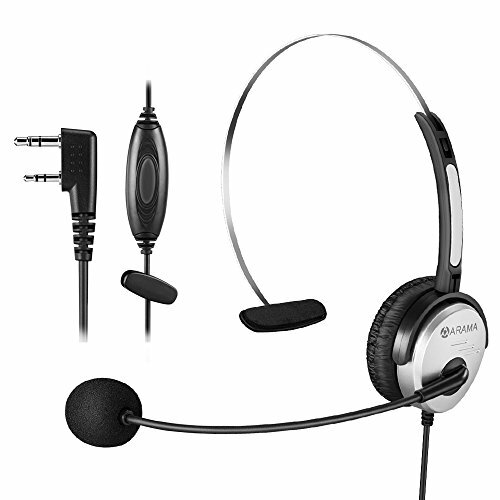 Professional headset with steel headband, you can bend the steel headband to fit any headsize. it's more durable and comfortable because the steel headband is adjustable hard to broke. a large PTT provides comfortable hand grasp. TH-D7, TH-D7A, TH-F6, TH-F6A, TH-F7, TH-K2, TH-K2A, TH-K2E, TH-K2ET, TH-21, TH-21AT, TH-21BT,TH-22AT, TH-22E, TH-25, TH-26, TH-27, TH-28, TH31AT, TH31BT, TH41AT, TH41BT, TH-42, TH-42A, TH-42AT, TH-48, TH-55, TH-75, TH-77, TH-G71, TH-235A, TH-235E. Great audio on transmit and noise cancelling microphone keep your smooth communication in the noise environment. Swivel boom MIC enable using with either ear, flexible for easy positioning. Adjustable headband provides all-day comfortable wearing. Compatible with 2 Pin Kenwood walkies talkies, including but not limited to Baofeng UV-5R, BF-888S, UV5RA, UV-82, UV-82HP, BF-F8HP BF-480 BF-490 BF-320 BF-V8 BF-520 BF-530 BF-777 BF-888 BF-999 BF-777S BF-999S UV-3R+ PLUS PoFung GT-3, GT-3TP Puxing PX-666, PX-777, PX-3288. See more compatible list in description. PTT MIC walkie talkie headset with steel headband, you can bend the steel headband to fit any headsize. it's more durable and comfortable because the steel headband is adjustable hard to broke. a large PTT provides comfortable hand grasp. The Noise Cancelling walkie talkie headset excellent for use in warehouses, security, restaurants, hotels, police, military, nightclubs, bars, paintball,, bouncer, and noisy environments. 1 year warranty and 30 day return with no questions asked. If you have any questions about this product by Arama, contact us by completing and submitting the form below. If you are looking for a specif part number, please include it with your message.